For those of you who haven’t heard (because your connection to the outside world has ceased due to the weather), we’ve experienced a number of substantial snowstorms here in New York City following the Christmas weekend and into the new year. Scratch that, our “substantial snowstorms” have actually been the first blizzards we’d been hit with in more than a decade. So how fitting was it that I had just presented my mom with a long hand-crocheted burgundy scarf for Christmas. Now, this scarf has had a long and interesting life following me across state lines over the past few years (even if it had been sitting untouched in my craft bag for the majority of this duration). See, I had learned to crochet from my friend and Hall Director Jenny a few years back when I was a Resident Assistant back in college. 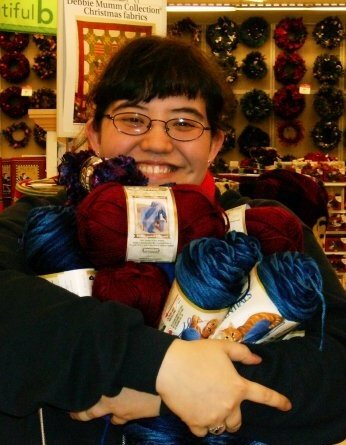 Once I got the hang of it, I went out to JoAnn’s Fabrics to pick up some nice yarn to make a scarf for my mom. I had decided to crochet the scarf lengthwise rather than the more conventional way of widthwise, so with seemingly little progress having been made about five rows in, and no end in sight, the project was relegated to my craft bag, not even half completed. It was not to be seen again until just a few months ago, when my best friend Christine took up her crochet needle again and inspired me to do the same. Textile production has long been associated with women and knitting and crocheting has long been associated with elderly ladies looking for a craft with which to occupy their time. I. Hate. This. Stereotype. Apparently, so do a lot of contemporary textile artists. Over the past few decades, textile art has been becoming more of a presence in the contemporary art scene, with focus shifting from function to the conceptual. 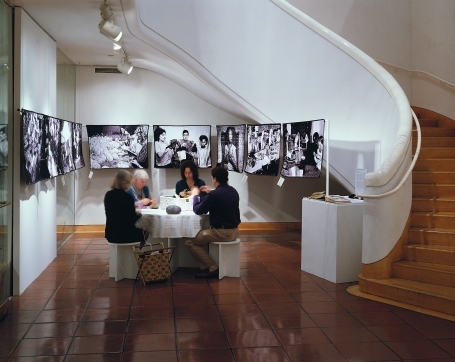 I was first exposed to conceptual textile art during my internship with the Museum of Art and Design in 2007, during which an exhibition called Lace and Subversive Knitting was on display. It was then, as I listened to the curator explaining the purpose of the exhibition, that I learned that contemporary artists had appropriated the craft to create designs based on form rather than function. This new, unexpected type of art served as an act of subversion towards gender and age stereotypes regarding textile production and moved textiles out of the “crafts” category. It was probably around that time that I first started being exposed to the concept of yarn bombing, but I wouldn’t really know what I was seeing until years later (aka last year), when I started researching the various ways that artists affect our urban visual landscape. In about 2004, a new type of bombing had emerged on the city streets. This movement has almost as many names as there are groups dedicated to it. Whether you call it knit bombing, guerrilla knitting, yarn storming, urban knitting, or yarn bombing, there is little doubt that this colorful alternative to street art is as unique as those who practice it. Yarn bombing is a movement that is still not incredibly widely-known, and is not especially widely-practiced when compared to other methods that artists affect the urban visual landscape, such as sticker-slapping, wheat pasting, stenciling, or just spraying with the aerosol can. It is practiced with some sporadic enthusiasm in a few major cities in Canada, the United States, Europe, Australia, and New Zealand with yarn bombers bringing the craft with them to new cities as they travel. As any of us who have ever crocheted, knitted, or cross-stitched can attest to, these are time-consuming projects. Often pieces are relegated to our craft bags, unfinished and forgotten. Even though the motion is repetitive, it takes time and some degree of skill to complete each piece, which could explain why this craft hasn’t taken off the same way aerosol art has. 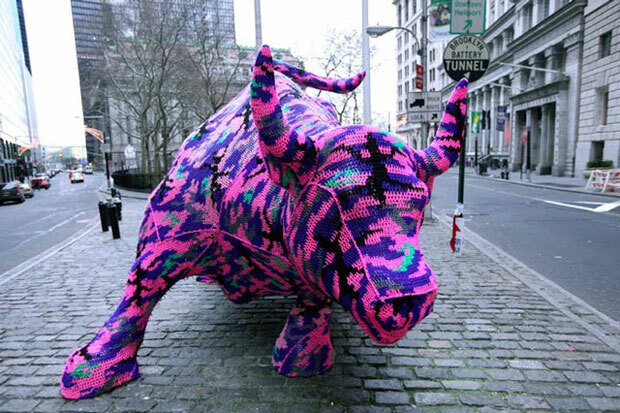 Recently, yarn bombing has made it back onto my radar via Olek, a Polish-born yarn artist who wrapped Wall Street’s infamous Charging Bull with a crocheted body cover in the tail-end of December. This tribute celebrated the proud tradition of guerrilla art, as well as sculptor Arturo di Modica, who had placed the bull there in Christmas of 1989 as a symbol of the strength and power of the American people following the stock market crash that year. Olek has also done a series of crocheted bicycles around the city, which I’m sure you’ve passed by at some point or another. Many of those who participate in yarn bombing are fascinated with the juxtaposition of a traditionally feminine media in a predominately male graffiti scene. Magda Sayeg, founder of the group Knitta Please, is fascinated with the juxtaposition of this woven material placed within an urban environment as one that questions the assumptions of a traditional craft while adding a previously unused material to the world of street art. Not only has this subversive use of yarn added color to the urban visual landscape, but it has inspired a new generation of knitters who no longer view function as the sole purpose for knitting. Yarn bombing has challenged audiences to reevaluate gender and age stereotypes, as well as given us a bit of a laugh while asking us to reconsider the age-old question of what can be considered art. Not only that, but it’s a great way to recycle and use those unfinished and forgotten pieces in your craft bag! The phrasing and the act of yarn bombing have proved unsettling to some graffiti writers, who don’t consider this unconventional method a legitimate movement in street art. But why not? After all, even wheatpasting, though it first met a degree of adversity and resistance from traditional aerosol writers, has become widely accepted in the realm of urban guerilla artfare. Perhaps they are unsettled by the encroachment into their own environment by a group of outsiders who themselves are not accepting of the roots of street art. What do I mean? Well, urban knitters haven’t been trying to find and establish their place in street art so much as they’ve been trying to make a statement. By haughtily pointing out that what they’re doing is more than “crude symbols” they themselves are not only perpetuating the misconception of graffiti, but also antagonizing graffiti writers and artists by minimalizing their craft. And when the desired effect is the same: to leave their mark and add some color, why squabble over the medium? 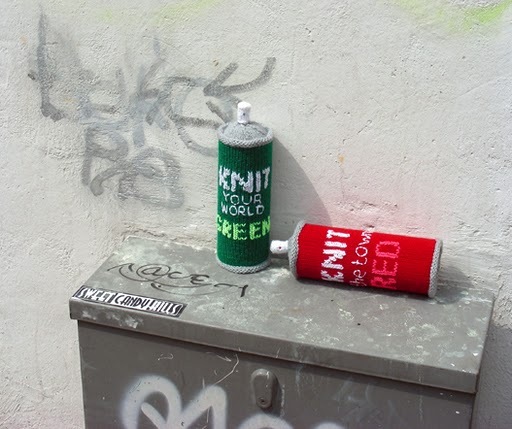 Bomb the world either way with these yarn covered spray cans! Anyway, the targets of yarn bombers are more often statues, gates, handles, trees, and poles rather than the walls, rooftops, and billboards favored by aerosol writers and wheatpasters. However, what graffiti and knitting have in common is that they’re both considered forms of outsider art. Traditionally recognized as a craft, knitting has struggled to take its place in the realm of contemporary art over the past few decades. Similarly, graffiti is traditionally considered a gang activity, or a form of destruction. It is only within the past decade that it has become more widely accepted as an expressive form of art. While I am uncertain as to whether or not yarn bombing has the capacity to develop into a complex, expressive, and widespread form of street art, I do love that it’s a hacking the environment, often with the intent to create humor, add color, and bring elements of the environment to the attention of passersby. 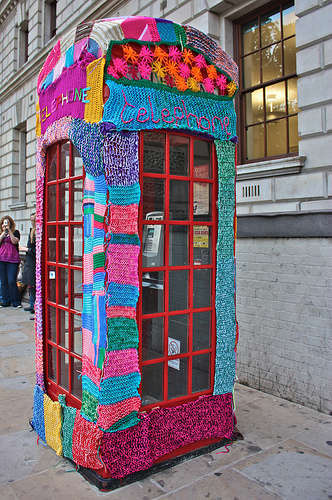 For some more information on the latest in yarn bombing news and events, visit Yarn Bombing, based in Vancouver, or Knit the City, based in London. These are only two of the many groups out there, but I felt they were worthy of a mention because both’ve also just released really nifty books that provide patterns and suggestions to get into the art of yarn bombing, as well as a sampling of projects undertaken by the organizations. All in all, I think that yarn bombing is a fun and legal way to affect our urban visual landscape, so if you know how to knit or crochet, why not make some gloves for that George Washington sculpture in Union Square, or some leg warmers for his horse? Why not cover that turnstyle at the subway station? Go out and have some fun with it! I really enjoyed your article, very nice write up, and thanks for using our jafagirl photo of the cop helping us yarnbomb 🙂 what a hoot that was. I too loath the stereotypes about knitting and also embroidery, as well as the antiquated notions about what knitting should be used for. As for your observations about street art, I totally agree. In many ways I find it ironic to hear *some* street artists (so called rebels), become so elitist and snobby about it, as if street art should only be one style, one mediium. How do you find out where a “yarn bombing will be”? I live in Olmsted Falls, Ohio and would like to participate in one. 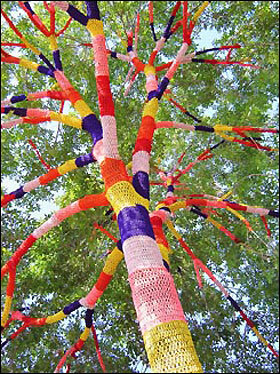 Does yarn bombing structures withstand the weather …. Is there a need to protect it with a spray varnish . Hi Joan, that’s a very interesting question. I am actually studying to be a conservator, so I was especially interested in responding to your question. To my knowledge, most yarn bombers do not use any sort of protection on their work, following the street art tradition of creating and displaying ephemeral art. Over time, it will be removed or decay as it is exposed to the elements. There may be a possibility to extend the artwork’s life with a spray, but textiles are, in general, exceptionally vulnerable to the elements, and sprays would actually decay as well (becoming tacky in hot weather or brittle and stiff in cold weather). So, spraying would still result in the piece’s eventual decay. Additionally, because it’s public, it may be removed long before that by someone who doesn’t like it, or like it too much!